As Seen on NBC's Today Show and the Rachael Ray show. What do Campus Quilt customers think about their t-shirt quilts? In general, they LOVE them! Customers frequently contact us to let us know how thrilled they are with their quilts. We also send our customers an email survey after they receive their quilts. Each response is posted live on our web site: T-shirt Quilt Customer Reviews. Read what happy Campus Quilt customers say! What is the order process? It's simple! You place your order online or by phone (502-968-2850). We send you an electronic kit via email. It will have everything you need to organize your shirts. Follow the instructions and mail everything back to us. Once we receive your items we will complete your quilt and ship it back to you within a few short weeks. How long does it take to finish a quilt? Can I include sweatshirts, clothes, ties, polo shirts, bathing suits, jeans, ribbons...? Yes! If we can stick a needle through it, you can use it. Many people are concerned about mixing sweatshirts with t-shirts, but they look great together. Give us a call to discuss your special project! Applique fees may apply. See below. Do you fully quilt or just tack the corners? Do you use a fusible reinforcement? We always fully quilt your t-shirt quilt. Quilting is the best way to ensure durability and it looks great. We don't use a fusible reinforcement. The purpose of the fuser is to make the fabric stiff so that it will hold together and not stretch (typically used when just tacking the corners). When we fully quilted ours, the quilting stitches reinforce the tshirts by attaching them to the batting and the backing fabric. This way you can keep the quilt soft and still have a quilt that will last for decades. Do I have to pay for the entire quilt up front? No. We charge a $100 deposit when you place the order. Then final balance will not be charged until your quilt is completed and ready to be shipped. Orders canceled within 60 days receive a full refund of the deposit. When you say a 30 or 36 or... square quilt, what is a square? A square refers to one t-shirt square within the quilt. A standard square is 15 inches on all sides and can be made from the back, front, or both sides of a shirt, sweatshirt, jersey, etc. It can also contain anything you want us to sew onto a 15-inch blank square, such as several pockets from t-shirts, ribbons, ties, hats, etc. We can make custom-sized squares upon request (additional charges may apply for custom sewn squares and sizes). When sewn together, approximately 14.5" of the square is visible on the quilt. The items for my Campus Quilt are special. How does Campus Quilt ease my worries? This is where Campus Quilt excels! We know your quilt items are special to you, so we want you to be as comfortable as possible during the process. Campus Quilt uses UPS to ship packages so we can track your package during shipping. We also email you at every stage, from the safe arrival of your shirts to the departure of your finished quilt, with tracking numbers and other pertinent information. We won't keep you guessing. Can Campus Quilt do embroidery? Absolutely! Over half of the quilts we create include a personalized embroidered name, message, or date. This is a great way to commemorate a special event or personalize a special gift. The image below illustrates your options. Can Campus Quilt make a Photo Quilt? Yes! We can transfer your digital photos to a quilt for you. You provide the digital pictures (800x600 dpi or higher), and we will take care of the rest. Please note we can only make photo squares as large as 8x10. Your photos will be printed on our color printer and then transferred onto white fabric. The fabric will then be cut to our standard 15 inch by 15 inch square. To provide your digital photos, email them to sales@campusquilt.com. Be sure to include your name and to number each photo to match the numbers provided in your t-shirt quilt kit. Try to give very clear instructions on any special requests or layout. Can I choose the layout of my t-shirts in the quilt? Yes. Each kit includes a special design package that allows you to lay out your quilt exactly the way you want it. We are happy to accommodate your special requests–just ask! Campus Quilt has made custom quilts of all kinds, and our general sewing expertise is unparalleled. Custom services are quoted upon request. What about backing and binding? Backing is the fabric on the side opposite your shirts. We use only 100% cotton backing fabric and we have about a dozen colors available. Binding is a one-inch border around the edge of the entire quilt. Let us know your choice on the instruction sheet we provide in your mailing kit. You may also use your own fabric; simply send it in with your shirts. When you order, we'll send you swatches of our fabric. See our available backing colors. Sashing shows as a 1.5 to 2 inch border around every shirt in the quilt. Sashing especially enhances a quilt when many of the shirts are the same color. You can choose the sashing color from our choices or send in your own fabric. What is batting and how thick is it? 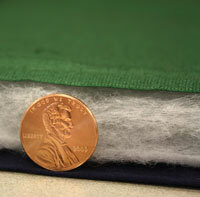 Batting is the layer of material between the t-shirt layer and the backing, making your quilt fluffy and warm. The photograph to the right illustrates the thickness of our high-loft batting. Someone else started making a quilt for me and and my t-shirts are a mess. Can you still make it into a quilt? Yes. We do this all the time. Sometimes we can just finish up the process. If the t-shirts are all different sizes or uneven, we usually applique them onto our own fabric and then sew them together. Either way. We can make it work. How are my shirts cut? The standard square size is 15''x15''. You may request a different size if you have already started cutting your shirts or if your designs are exceptionally large. 98% of shirts from children's to adult's will fit in this size. Figure 1 shows the usable area from which we will cut the 15''x15'' square—from the base of the collar to slightly above the bottom. Figures 1.1 through 1.5 give examples. All graphics that can be centered within this area will be but it isn't always possible. If you would like any shirts cut in a special way, you will have a chance to tell us when you send in your t-shirts. Applique fees may apply. See below. Is there anything I should avoid when I lay out my quilt? Figures 2 and 3 illustrate the binding zone on your quilt, which cuts into the 15'' square. If you have a shirt with graphics near the binding zone, it is in danger of being cropped. Try to place them elswhere in the quilt or give us permission to cut and center the designs. Can I wash my Quilt? Yes. Campus Quilts are as washable as the materials selected to go in them. We suggest caring for your quilt as gently as you would care for the most sensitive fabric in it. Quilts made of pre-washed cotton t-shirts can be machine washed with cold water and line dried. If you have a red or dark-colored backing or sashing and any light-colored shirts, you should dry-clean your quilt just to be safe. Do I need to wash or cut my t-shirts for you to make the quilt? Wash, yes. Cut, no. Washing your shirts prevents the colors from bleeding and makes working with them a little more pleasant for the CQ sewing team :) But leave the cutting to us. Just send us your clean, whole shirts and we'll send back a cozy Campus Quilt. What if my t-shirts have holes or stains in them? We accept any t-shirt you provide expecting you to understand that the quality of your Campus Quilt depends somewhat on the quality of the t-shirts provided. Stains and small tears can add character to the quilt if there is a great story to go along! What happens to the scraps from my t-shirts after the squares have been cut? Campus Quilt Company disposes of the t-shirt scraps for you. If you would like us to save your scraps, we can ship them back for a postage & handling fee. What colors do you have for your backing fabric? 100% cotton backing fabric is included with your quilt. Cotton flannel is available as an upgrade for an extra soft and warm quilt. Our fabric colors are listed here. All trademarks are property of their owners and are not connected with Campus Quilt Co, the quilt maker. #1 Top Quality - Our quilters have years of experience making custom t-shirt quilts. #2 Great communication and service make sure your t-shirt quilt is exactly the way you want it. #3 We actually quilt, instead of just tacking the corners. Isn't that what you'd expect in a t-shirt quilt? #4 Speed - Our t-shirt quilts average 2-4 weeks with rush turn around available in 1 week or less. Plan for a little extra time near Christmas and graduation.